While back pain grabs the majority of the headlines, neck pain can be equally debilitating. Thankfully, it is also just as treatable as its more famous cousin. 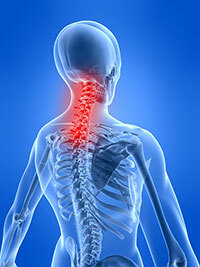 The proper treatment depends on the cause of the neck pain you are experiencing. Some of the most common causes of neck pain, though certainly not the only ones possible, include a cervical herniated disc, cervical stenosis, muscle strain degeneration of the facet joint cartilage, and osteoarthritis of joints like the hips and knees. A sprain of the muscles, ligaments, or tendons in the neck area can cause acute neck pain. Vehicular accidents, lifting heavy objects frequently, and awkward sleeping positions are the most likely culprits. Most minor ligament or tendon injuries in the neck will heal over time with proper care, including rest, ice or heat application, and rehab such as chiropractic care and physical therapy. Many neck pain sufferers share a common symptom, an ache that radiates down the arm, sometimes into the hands and fingers, that is accompanied by numbness or a tingling feeling. This is called foraminal stenosis, a condition caused by degenerative changes in the neck joints. This, in turn, causes chronic neck pain.